Need a quick summer holiday? 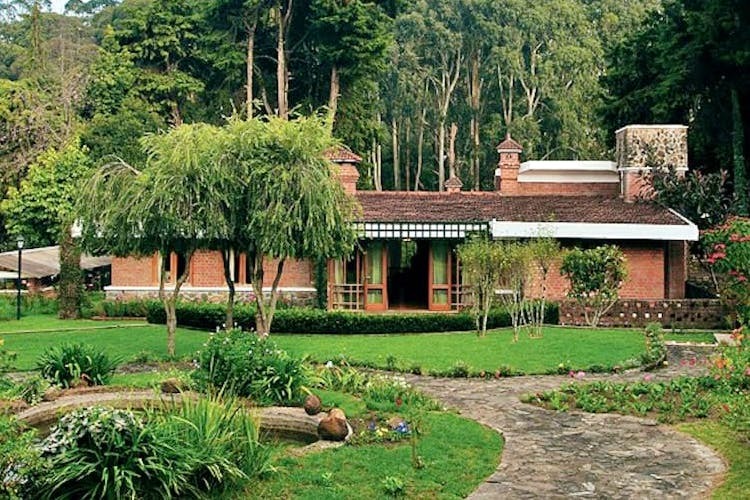 It can’t get any better than at the Quaint Chalet In The Hills in Kodaikanal. It’s the perfect spot that’s away from the hustle and bustle. Just take the fam and escape! It really looks straight out of an Enid Blyton story or The Shire from The Lord of the Rings with the cobbled-stone pathways, a little pond out in the lush green garden, and terraced lawns. In the middle of it all is the Quaint Chalet In The Hills that’s nestled away in the cosiness and crisp mountain air of Kodaikanal. Add in fireplaces, wooden furniture, pinewood floors, ceilings, cabinets, a gazebo with a fireplace, and a sit-out under rose creepers, you have got the makings of a great vacation. Plus, there’s that chimney that keeps smoking adding to the whole fairy tale setting. It couldn’t get any dreamier or even more romantic than this. Can you feel the love tonight? Three ensuite bedrooms on the first floor can accommodate a maximum of six guests; we’re looking at you couples for this. But if you are checking with the entire family, two sofa-beds in two rooms should see to it that up to nine people can sleep peacefully. There’s a third sofa-bed that’s perfect for the kids and is out in the lounge area. It’s safe to say that the chalet can accommodate a total of 14 people at a time, meaning you can finally plan that extended family vacation that’s been on paper forever. Kids, parents, grandparents, and pretty much anyone you call fam will see the hero you are! Once you have made yourself comfortable inside, go about and explore the place. The common rooms and family rooms all face the front and back lawns, and that’s the best view within the house. Cook up a storm at the large well-equipped kitchen or leave it to the caretaker, Nagaraj, to help you with your meals that come at additional charges. He’s around 24/7, so be sure to ask him for anything including arranging for bicycles for rent and transportation. The gazebo makes for a nice spot for breakfast and watch the sunrise and the mist lift over the hills. Also for a marriage proposal. OK, maybe we went overboard. Come evenings, warm yourself by the fireplace at the gazebo before retiring to bed. Campfires can be arranged on request too! Remember to pack marshmallows. The terraced lawns, the landscaped gardens with prettiest blooms, and the small fish pond can easily be accessed by the cobbles-stone pathway. Oh, the sitout under the rose creepers with a built-in swing seat is perfect for those Insta-worthy pictures and family portraits! For six people, at the time of writing this recommendation, the per night charges are INR 20,005 and is inclusive of breakfast. You can book the room here.